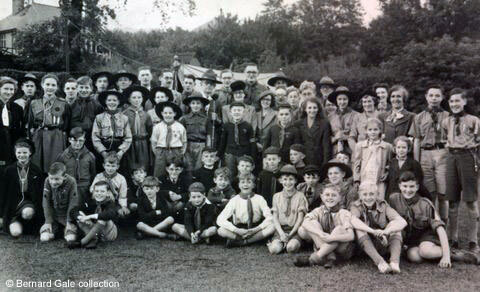 The photograph of the Scout Rally was taken in the corner of Causeway Lane Field. The house in the background, on Steep Turnpike, was the home of Dr. Morton. Amongst the names below are scouts from at least two local Troops. The 4th Matlock Troop, which was founded by Harold Fletcher, used a room under the Congregational Church for Scout meetings for a time. However, the Scout Troop wasn't attached to any of the local churches and they mostly met in an upstairs room in a building next to the Boat House Hotel. On Remembrance Sunday they would march from there, go along Causeway Lane and then up to the War Memorial on Pic Tor. Some of the 5th Matlock Scout Troop, who were attached to All Saint's Church on Smedley Street, are also on the photograph. The cubs are all in the first two rows, seted on the ground (approximately nos.40 to 53 on the outline image below). However, there are scouts amongst them - wearing shirts. Below is an outline image, but with numbers added to mark individuals. Not all names are known at this time. Photograph, names and information provided by and © Bernard Gale, who scanned the image. Outline image with numbers produced by Ann Andrews from an earlier image from Bernard. Later additions from Ken Smith. Harold Fletcher was District Scout Commissioner and eventually became assistant County Commissioner for Derbyshire Scouts. He was Company Secretary of Derbyshire Stone Ltd. and subsequently became Assistant Managing Director. He was also a Magistrate in Matlock. By 1952 W H Briggs had become District Scout Commissioner. Known to have belonged to 1st Matlock Bath Cubs, either as leaders or cubs, in 1948.